"Ok," I said. "Your airplane." The man in the right seat squared his shoulders, sat bolt upright, and primly reached for the Piper Cherokee's yoke with both hands. He slid his feet to the rudder pedals as I, with some trepidation, withdrew from the controls. It was only the third time I had ever relinquished an aircraft's controls to a passenger and I was still developing my own comfort level with that process. As we flew over the colorful autumn terrain of southwest Michigan, I divided my attention between the sky outside the airplane and appraising my passenger. He was dressed tidily, wearing a brightly colored button down shirt. His face was a mask of concentration, his brown hair exhibiting hints of gray at the temples that imparted a mildly distinguished appearance. "Feel free to make some turns," I encouraged. Without altering expression or posture, he banked the airplane into a well-coordinated left turn of thirty degrees while maintaining a constant altitude. Then he performed a right turn followed by another left. In this way, we tore up the air for over an hour, venturing as far as the Lake Michigan shore. His skill in directing the airplane through the sky was remarkable; smooth, coordinated, and --­ in his inimitable fashion --­ meticulous. It was not until I indicated that the rental aircraft was due back at the airport that I observed a change in expression; he pouted. It was the first time I had ever seen a grown man pout like a child, but I knew that the pout was simply a reaction to my ending the indescribable joy he felt over being at the controls of an airplane again. Enjoyed my aerial color tour! - Brian Glass, he wrote in my logbook when the flight was over. I first met Brian in the fall of 1999. We started within a month of each other at The Company in Kalamazoo, working in the same laboratory. We were pharmaceutical newbies on opposite ends of the spectrum; I was directly out of school and he was an experienced chemist from a different industry. I took an immediate liking to Brian. He was kind, patient, and possessed with an enthusiastic curiosity as a scientist. We called him "The Wildcard". This was not one of those ironic nicknames, like calling a big guy "Tiny". Beneath Brian's placid exterior lurked a healthy, often mischievous, sense of humor that ran the gamut from subtle to outrageous. We never knew what Brian was going to do next. Whether it was spontaneously bellowing "KHAAANNN!" toward the heavens while working at a Cahn microbalance, gleefully running his wheeled desk chair over bubble wrap while rolling his eyes in delight, or imitating a seagull choking on an onion ring at the West Lake Drive In (in a particularly memorable episode), Brian's sense of humor was often the highlight of my day. Brian was an artist and his talent was in crafting the hilariously unexpected. "Wildcard" was a badge of honor that only Brian could ever wear. When Kent and I began flight training, Brian revealed that he was fascinated by flight and had taken lessons, but never soloed. After disclosing a one-time childhood incident on his medical application, the FAA demanded he undergo an onerous and expensive regimen of testing. Stymied by the FAA, Brian gave up on his dream of flight and maintained a vicarious link to aviation through a subscription to Flying and periodic missions flown in Microsoft Flight Simulator. To my mind, the best gift that I could ever give him was time in the right seat of a single engine airplane. That is how Brian and I came to be flying together in October 2003. It was the first time I had ever flown with a lapsed aviator and I was amazed at the retention of ability. His hands and feet knew exactly what to do, well imprinted from primary training years before. Brian never held a pilot certificate in his hands, but his soul was truly that of an aviator. Brian and I flew together many times over the years after that initial flight in the rental Cherokee. Because Brian was part of the extended work family that moved from Kalamazoo to Rochester, NY with me, those flights encompassed my time renting airplanes out of Three Rivers, MI; basing Warrior 481 in South Haven, MI; and my many years at Le Roy, NY. On one particularly memorable evening, Brian and I were flying together over the Lake Ontario shoreline when we saw the skyline of Toronto (~75 nautical miles away) silhouetted by the sunset for the first time. Brian was a part of my daily work life from September 1999 until December 2013. There was a change in control of our company that resulted in substantial layoffs. Brian, along with several other members of our ex-Michigan cohort, found himself looking for work. Weeks later, Brian and I were with our old friends Kent and Dan. Conversation turned to our favorite Brian moments; Shatner impressions, bubble wrap, seagulls eating fried foods, et cetera. Brian remained uncharacteristically quiet even as we teased him about a newly grown beard and playfully roasted him over past antics. His doctors encouraged us to talk to him, read to him, laugh with him. They told us that, sometimes, a person fighting for life in a medically-induced coma can hear words of encouragement spoken by their loved ones. Our conversation was underscored by the sound of a ventilator as Brian struggled to overcome complications from an aggressive flu contracted over the holidays. I spent a lot of time at the hospital with Brian, just talking. I reminisced about the times we shared aloft, something unique that he and I shared. I urged him to come back to us and fly with me again. Unresponsive in his coma, I never knew whether he heard me or not. On January 29, 2014, the evening of our impromptu roast in intensive care, I departed the hospital to retrieve my daughter from school. Twenty minutes later, I received the call that Brian lost his battle. I think of him often when flying alone in the Warrior. Sometimes, I take comfort in imagining him flying with me, quietly, primly, with both hands on the controls. I treasure the tangible evidence of our first flight together, his distinctive signature in my logbook. I do not claim to understand what happens when we depart this world, but I like to think that Brian is now beyond the bureaucratic reach of the FAA and cleared for unrestricted solo flight. In memory of Brian J. Glass, April 4, 1956 - January 29, 2014. Eight years ago on a cold January day, I beheld the stark winter beauty of the Adirondack Mountains for the first time. Today, weather conditions permitted a rare January trip out of the local area and I seized the opportunity for a return. Sodus Bay was mostly frozen over, the ice adorned with curiously patterned tufts of windblown snow. Clouds along the route were variable, changing from nonexistent to broken. Although surface winds were out of the southeast, flight on an east heading at 5,500' yielded a true airspeed of 125 knots and a ground speed of 146 knots. Clearly, there was a significant shift in wind direction below. There was also an inversion present; the outside air temperature at the surface was -2°C (28°F) while the air temperature nearly a mile above the surface was a remarkable 4°C (39°F). Warrior 481 flew hands off in smooth air most of the way to the mountains and, as I sat with arms folded comfortably across my chest, I was suddenly struck by the often invoked "magic carpet" analogy. Our route was direct from Sodus to Piseco (above), where we turned northeast toward Lake Placid. Flying along the same route taken eight years ago, our course ran parallel to Indian Lake. Nearer to the High Peaks, we slipped under a stratus deck that varied from broken to solid overcast. The layer was entirely unperturbed and gave no indication of any turbulence caused by the wind aloft burbling through the peaks. The air remained entirely smooth as we navigated among the peaks. From the sectional chart, I chose a route through this valley between Mount Marcy (the highest peak in the Adirondacks) and Dix Mountain (the sixth highest). This path took us east of Lake Placid, around some of the higher peaks, and allowed access to Lake Placid from the northeast near Whiteface Mountain. I usually try to keep airplane bits out of my photos, but sometimes a stray wingtip helps place the scene into better context. Sunbeams occasionally broke through the stratus deck to provide some color. Upon reaching Whiteface, I turned southwest toward Lake Placid and began a descent toward the airport. Tiny black dots zipped along white thoroughfares traced on the slope of the mountain. Lake Placid sits in a broad valley partially ringed by large peaks to the southwest, south and east. The airport is south of town. Beyond, low peaks herald the presence of higher mountains. My inbound radio call was answered with a wind advisory from the airport: winds were light and out of the north. Unicom wind advisories were relatively common when I was learning to fly, but they are unusual today. It was a nice change. On downwind for runway 32, I flew past the Olympic ski jump towers adjacent to the airport. I topped off the fuel at $4.95/gal, grateful to finally see aviation fuel prices dropping (as they have recently at Sodus and Le Roy, as well). In the fall, we planned a club fly-out to Lake Placid. Though the activity had been my idea, I was unable to participate. Instead, we flew in the opposite direction, to Pontiac, to visit family. The mass arrival of Williamson Flying Club members on that beautiful fall day made quite an impression on the folks at Adirondack Flying Services. The guy who fueled my airplane remembered it and remarked on how cool it was to have so many airplanes arrive together. He encouraged us to come back in 2015. Inside, the FBO had been completely remodeled since our last visit. When I asked if the work was recent, I was told that it happened three or four years previous. I was shocked that it had been so long since my last visit, but it had. Our last flight to Lake Placid took place in July of 2011. No wonder I was inspired to fly to Lake Placid; I was overdue. Clearly, Lake Placid had already experienced a lot more snowfall than Rochester. 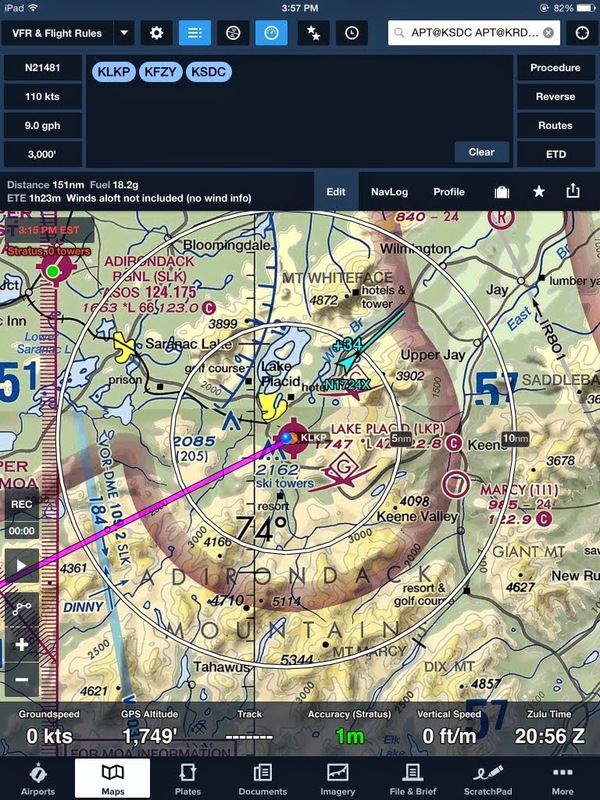 Preparing to depart for home, I saw something in Foreflight that I had never seen before. It was my first time observing an ADS-B aircraft target appear in Foreflight, a Cirrus that overflew the field and only announced its presence on Unicom once I declared my imminent departure. Knowing that I would have a headwind going home, I planned a more direct route that would take us through a set of MOAs. Though they are usually cold on weekends, I contacted Boston Center for flight following. We climbed to 6,500' to clear terrain with a large margin. After a day spent surrounded by the stark monochrome of snow-covered mountains, appearance of warm color on the horizon hinted at the coming of a spectacular sunset. The last hour home was flown in darkness. Near Oswego, our ground speed increased to a more expeditious 88 knots. We were converging on Sodus with one of the club planes, Archer Eight Five X-Ray, and I decided to let the other aircraft land first. My concern about the surface winds was relieved by an AWOS broadcast of winds 170° at ten gusting to fifteen. Sure, a crosswind, but nothing unmanageable. The wind data served to highlight evidence of windshear; at 4,500', I was still flying with a headwind out of the west. The AWOS lied (not for the first time). Ahead in Eight Five X-Ray, Mike advised that I was in for a wild ride. I was; the Warrior and I were buffeted by strong wind gusts from the right as we negotiated final approach to runway 10. I do not know the actual wind velocity at the surface, but it was much stronger than advertised. Though we landed smoothly enough, the strong broadside wind caused the tires to squawk a couple of times before the weight of the airplane finally settled fully on the landing gear. It seemed a terrible way to treat a set of good tires. Despite the lousy conditions at home, it is always a pleasure to visit the mountains and Lake Placid and I am grateful for decent weather that provided the opportunity.